"SPRING-SUMMER IS HERE AND SO ARE THE PESTS-WHO IS IN YOUR GARDEN?" Spring is the most beautiful time of the year for roses. And the bugs think so too!! There are several bugs, some good and some bad, that will be showing up in your garden to see what you have prepared for them for their spring feast. 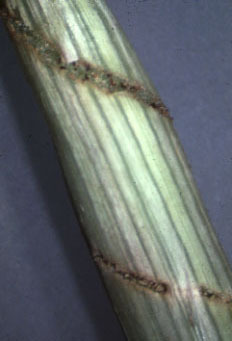 By looking at your plants early and often-before they bloom-you can observe signs of damage and figure out "who" is causing it. By catching these pests early you may be able to prevent a lot of damage before it gets out of control. 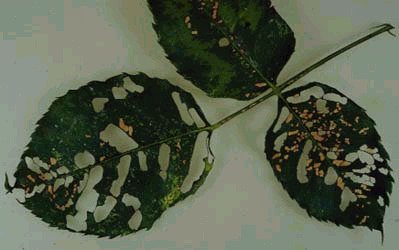 A way to help identify what pest you have on your roses is to determine what type of damage he is doing. 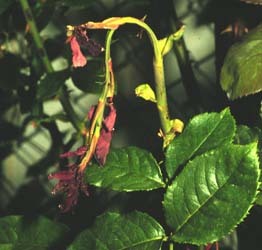 There are sucking insects that extract nutients from the plants and there are chewing insects that remove parts of the rose plant. 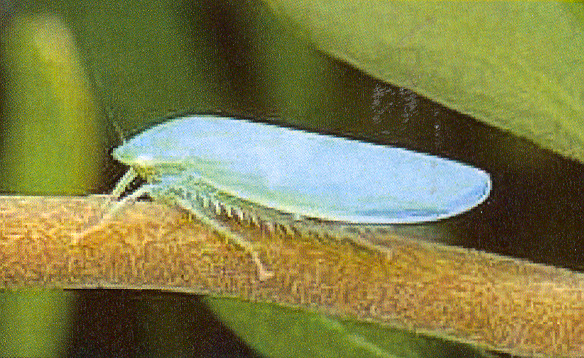 The rose leaf hopper is a sucking insect that appears in the spring. They are a long, slender wedge shaped insect that can be shades of green, yellow or brown. 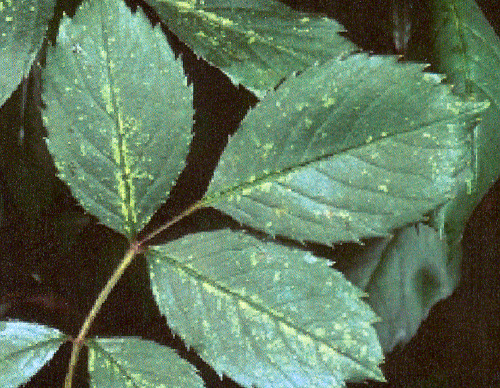 They damage leaves by leaving them with a stippled pattern. 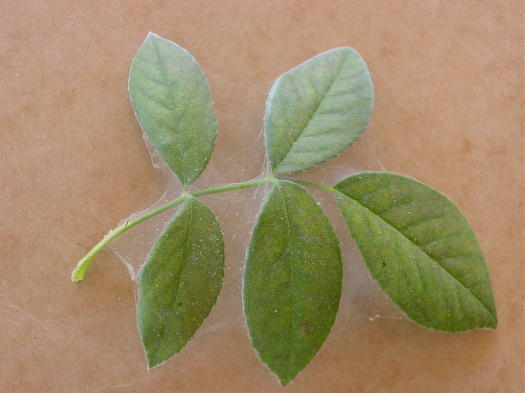 The leaves may also have a chalky residue, honey dew or sooty mold can appear. 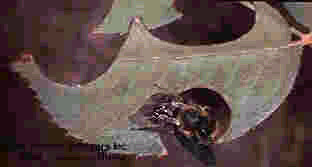 The other major sucking insect is the dreaded spider mite. They are very tiny but you can see them crawling, usually on the underside of the leaves, because there are so many of them. They may be red, brown, yellow or green. They first appear at the beginning of the summer. 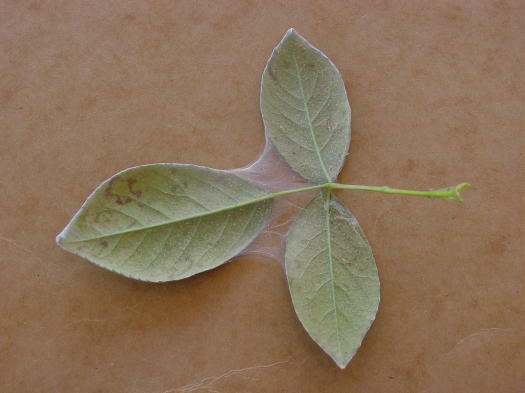 They leave stippling on the leaves and the underside of the leaves will have very fine webbing. The leaves will look dull and gray, probably turn yellow and then fall off. The best control for these pests is to wash the plants off frequently with water. Be sure and get the underside of the leaves too. 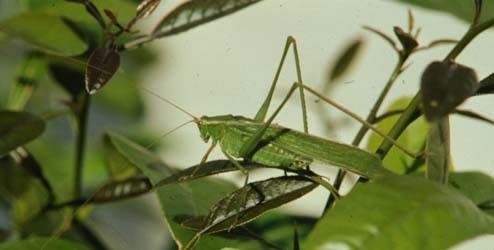 Katydids are a chewing insects that appear in the spring. They are large and green and look much like a grasshopper. They chew edges of leaves, flowers and buds. The rose slug is antoher chewing insect that show up in the spring. They appear on the upper or undersides of leaves. They look like a thin slug or a very tiny worm. Their damage is easy to recognize. They skeletonize the leaves which leaves large holes and only the veins of the leaves are left. The rose curculio is a chewing insect that prefers yellow and white roses. He is a red to black snout weevil about 1/4 inch long. He punches holes in flowers and buds and may create ragged holes in blossoms or kill a developing bud. 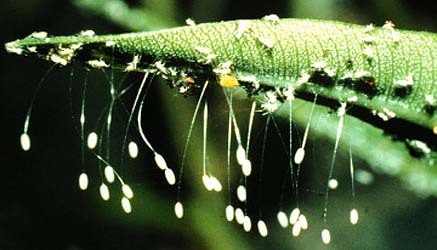 Larvae may feed on buds killing the bud before it gets a chance to bloom. The most familiar of the chewing insects is the leaf cutter bee. He also appears in the spring and looks much like a small bee with bands of light color across his abdomen. His damage is unforgettable. He makes semicircular holes in the margins of the leaves. He uses this to build his nest. The raspberry horntail is also an insect who leaves unforgettable damage to your roses. 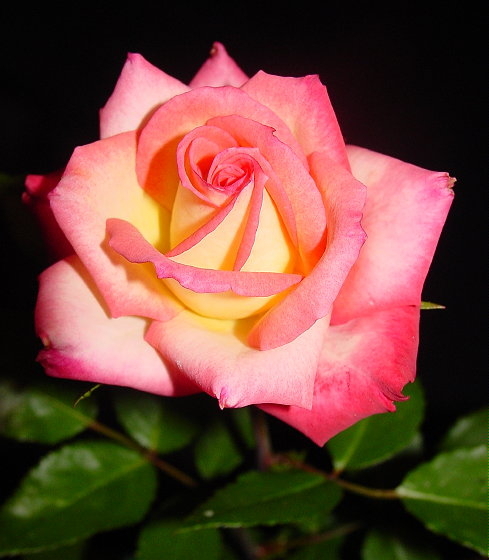 He appears in spring when the new tender rose buds are forming. 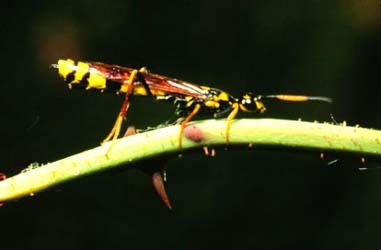 The adult raspberry horntail is black or black and yellow, is wasp like and about 1/2 inch in size. 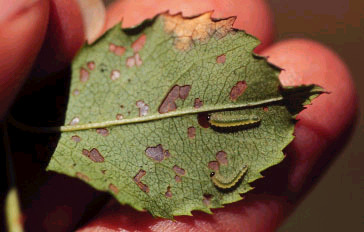 The larvae are white and do the damage. 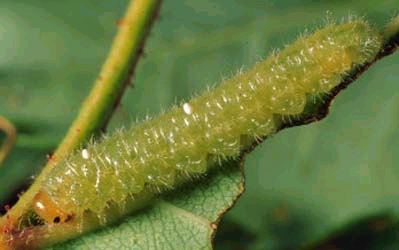 The caterpillar, about an inch long, will drill a tiny hole to deposit eggs which causes the tips of the new tender canes to wilt. After this happens there isn't much you can do but cut back to a five leaf leaflet and let a new bud form. Along with the "bad guys" there are some "good guys" too. Assassin bugs are beneficial predators that appear in your garden from spring to fall. They are a slender colorful insect that can have brown, red or blackish long legs. They have a long narrow head, round beady eyes and a needle-like beak. Their targets in the garden are aphids, caterpillars, leafhoppers and other bugs. 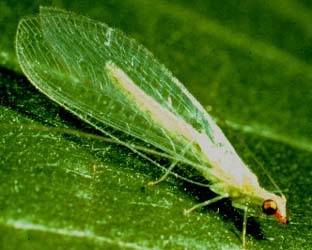 They also feed on lacewings which are considered a beneficial insect. "Big eyed bugs: are also beneficial predators. They are oval in shape and about 1/4 inch long. They are usually brownish or yellowish with a wide head and prominent bulging eyes. They feed on aphids, leafhoppers, spider mites, thrips and other soft-bodied insects. The gray-green to brown alligator-shaped larvae are the predators. The green lacywinged adults feed on the honeydew of the aphids. 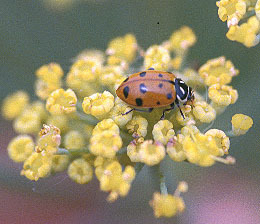 The lady beetles (lady bugs), red and black, are probably the most familiar beneficial predators found in your garden. They primarily feed on aphids in both the adult and larvae stages. The larvae are black alligator-shaped with orange dots. 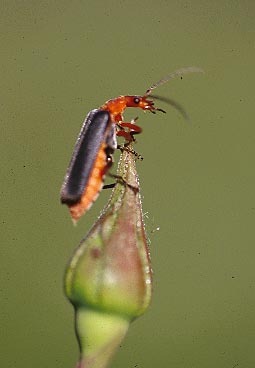 The soldier beetle is a moderate to large-sized beetle with dark wings and orange or red heads and thoraxes. 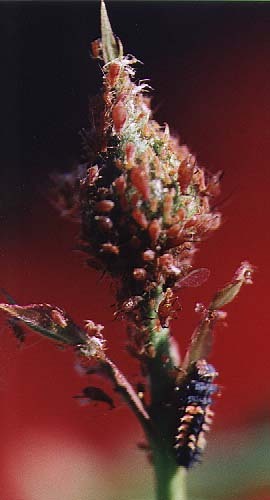 They feed on aphids and are often found on roses. 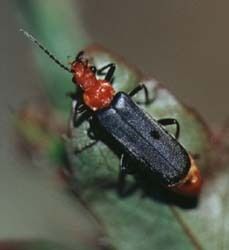 They may be mistaken for pests, but they are predaceous as adults and larvae (in the soil). Sometimes they leave dark splotches of excrement on leaves. The syrphid fly is another "good guy" that looks like a small wasp. It's also is known as the flower fly or hover fly. 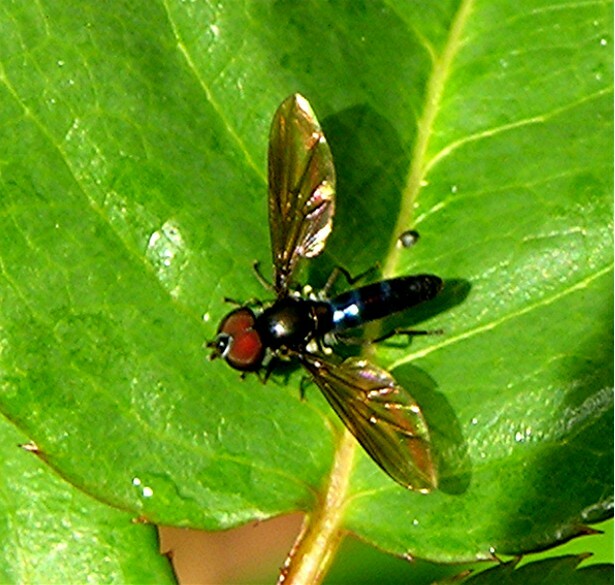 There are many species of the syrphid fly found in California and they can vary in color from dull brown or yellow to bright green, but most will have a yellow longitudinal stripe on the back. 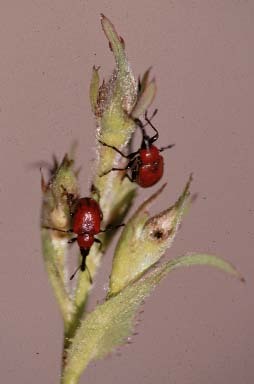 They are predators of aphids and are very commonly found in the rose garden. They feed on the nectar and pollen before reproducing and are often seen "hovering" above flowers. The larvae are legless and are maggot shaped. Control for these pest in your garden should be as environmentally friendly as possible. Use the integrated pest management (IPM) approach. Decide on the level of damage you can tolerate and use the least toxic method. It progresses from cultural, mechanical to biological. If none of these methods control the damage the last method to use would be chemical. 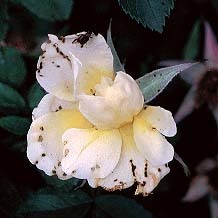 Hopefully, you can learn to tolerate some damage to your roses and not have to rely on using chemicals to control your pests. By using less chemicals in our gardens we can encourage the "good guys" to stick around. If we can do this we are progressing to a greener environment.